ENR released its Top 600 Specialty Contractors for 2010. Gate Precast Company consistently ranks in the top 100 annually, and this year the precast concrete manufacturer ranked #4 in the Concrete Division and #99 overall. Dean Gwin, President, COO of Gate Construction Materials Group was interviewed in the annual report which focuses on the recession's affect on specialty contractors. 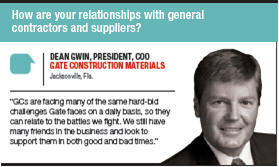 Gwin was asked about Gate Precast's relationship with general contractors and suppliers. "GCs are facing many of the same hard-bid challenges Gate faces on a daily basis, so they can relate to the battles we fight. We still have many friends in the business and look to support them in both good and bad times," Gwin said. When asked about his forecast for economic recovery to the sector, Gwin replied, "Our research shows it could be a minimum of three to five years before we see any substantial improvement." Albeit this market has been difficult for several years, opportunities do exist. "Gate Precast Company is offering more products, scrutinizing all expenditures and is willing to hang in there regardless of how long the current economic conditions last,"
This is welcome news. I applaud their commitment in providing affordable construction materials. This is a very sustainable model. That's a very good news indeed. People are looking for more affordable yet high quality products for building constructions.